Progeny MMXIV is a free child theme for Twenty Fourteen which includes custom integration for the AudioTheme Framework, a plugin built to work with any WordPress theme, providing the features needed for a music-oriented website and allowing you to take your content with you anywhere you go — even when switching themes. In Progeny MMXIV, we’ve enhanced the default functionality of Twenty Fourteen on various levels. Customized page layouts for music, videos, and gigs adapt to the layout and design of Twenty Fourteen, making your fans experience seamless and easy. 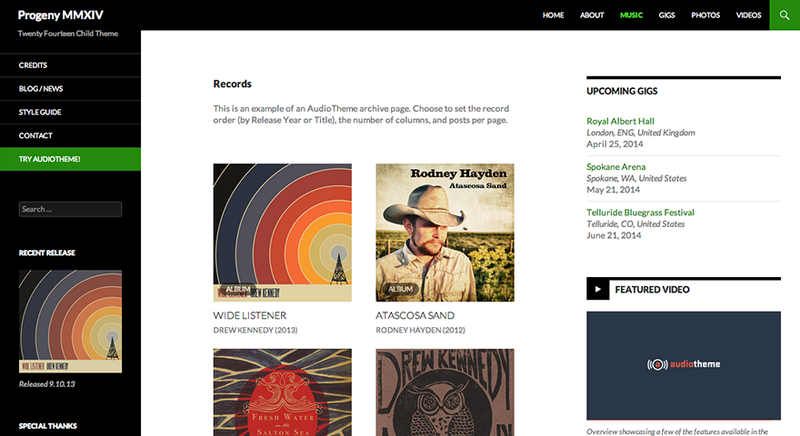 Added support is included to feature music and videos within Twenty Fourteen’s featured content grid or slider, too! Featuring a new record or listing your upcoming shows doesn’t get any easier than adding a widget to sidebar area. With Progeny MMXIV, you’ll have access to the AudioTheme frameworks record, track, video, and upcoming gigs widgets, all styled to match Twenty Fourteen’s clean design. We loved the concept of Twenty Fourteen’s Contributor page template. We decided to extend this templates functionality to allow more control over the users and content displayed on the page. Progeny MMXIV allows a list of user ID’s to be set via a custom field providing a way to showcase members of your band. If set, links to Twitter, Facebook, and a personal website are displayed for each user, too! Social networking is a big part of connecting with your fans. We tapped into Twenty Fourteen’s icon font and included automatic detection for adding social icons like Twitter, Facebook, Pinterest, Google+ and more directly into any menu navigation.